What is a deep vein thrombosis (DVT)? A DVT is a blood clot that forms in a vein deep in your leg. This blocks the normal flow of blood through your leg and can cause pain and swelling. Sometimes part of the DVT can break off and travel to your lung. This is called a pulmonary embolism (PE), which can be dangerous. 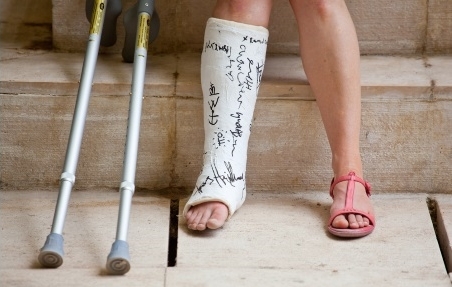 Being in a plaster cast slightly increases your risk of a DVT. This is because you are not moving around as much as usual, and so you have reduced blood flow. Surgery and broken bones can also add to this risk, because they can cause changes in your blood vessels. Tell your doctor or nurse if you have any of these risk factors, so they can decide if you need to be treated to reduce your risk of a clot. What are the symptoms of a DVT and what should I do? A DVT typically causes pain, a tender calf, swelling in the affected leg and sometimes redness. If you have been injured and your leg is in a cast, some swelling is normal. But if you think the swelling is increasing despite keeping your leg raised (elevated), or if the pain is increasing even though you are taking what should be enough pain relief, contact the Orthopaedics Outpatient Department (OOPD) on (03) 364-0800 ext. 88692. Or you can make an appointment to see the OOPD, your follow-up fracture clinic, your GP or the Emergency Department. If your leg swells a lot after the plaster cast is taken off, it's also important to see a doctor. What can I do to reduce my risk of a DVT? Stop smoking. Ask your doctor or nurse for advice about stopping smoking, or follow the advice in Being smokefree. Do regular exercises, such as moving your toes or walking around with the help of crutches. Be careful not to put weight on your injured leg if you have been told not to. Your doctor will let you know if you are at high risk of developing a DVT and need medication to help prevent it. If you have any concerns about your injury or plaster cast phone the clinic that first treated you or Orthopaedics Outpatients Department on (03) 364‑0800, or see your GP. Written by Orthopaedics Outpatients Department, Canterbury DHB. Adapted by HealthInfo clinical advisers. Last reviewed December 2015.